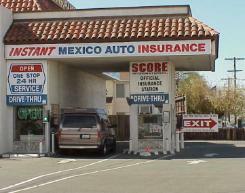 An approved Mexican insurance policy. All persons driving in Mexico are subject to the same laws as Mexican citizens. Your U.S. liability policy, even if it bears a limited Mexican endorsement, is not recognized by Mexican authorities. 1. DEDUCTIBLE RISK 1 Collision, Upset, Glass Breakage Five Percent (5%) of the sum insured or $500.00 U.S. currency whichever amount is greater. For Motorcycles the deductible is a flat $5,000.00. 2. RISK 2 Fire, Total Theft Only, Comprehensive acts of God, ect. Ten percent (10%) of the sum insured, or $800.00 U.S. currency whichever amount is greater. 3. Property Damage This protects you against losses resulting in damage that your vehicle might cause property owned by others, provided you are legally liable. 4. Civil Liability This covers your legal liability for injuries or death to a third party resulting from the use of your vehicle. (NOTE: occupants of your vehicle are not covered under this risk). 5. Medical Payments This covers you to the limits stated on your policy for the occupants of your vehicle in case of collision, upset, or fire. For motorcycles there is no coverage’s for this risk. 3. for Mexican bail bonds, INSTANT LEGAL will pay the premiums and become co-sucurity when guarantee does not exceed $1,000 dollars.